Starving to Death: Does My Child Have an Eating Disorder? Michelle’s parents did not address her anorexia until she weighed less than 85 pounds. At 5’10”, she was a skeleton compared to the healthy teen she had once been. “My mom and dad said nothing to me about my weight loss, until one morning at breakfast when my father slammed a stack of pancakes down in front of me and demanded I eat them,” she said. “I refused.” Michelle’s eating disorder began when her older sister died in a car accident. “At first I didn’t want to eat, I was grieving so much. But the subject of my sister’s death was taboo at my house—we weren’t even allowed to mention it. I continued to refuse food because of the pain I was in, and their unwillingness to see it.” Fortunately, after that breakfast table incident, her mother sought treatment for Michelle with a counselor who specialized in eating disorders. “I’m sure it saved my life,” said Michelle. Of all psychiatric illnesses, eating disorders have the highest fatality rate. Nearly 45,000 people die from them in America each year, and that number is growing. The two most common eating disorders are Anorexia Nervosa—where the person has a distorted body image and severely restricts their intake of food, sometimes to the point of starvation—and Bulimia Nervosa, where the key symptoms are binge eating followed by purging, either by vomiting or using laxatives. Many factors play into the weight loss obsession, including genetic predisposition to the disease, family attitudes about food, the friends a teen chooses to hang out with, the presence of depression or anxiety, biological make-up, and a perfectionistic or obsessive personality. In addition, images from the media of painfully thin models and actresses bombard kids daily, teaching them a distorted definition of what is normal, and encouraging them to aspire to a goal that is unattainable for most. Often, like in Michelle’s case, a traumatic event may trigger the onset of a disorder—a death, their parents’ divorce, sexual abuse. The statistics about where we’re headed as a nation are disturbing: 40% of fourth graders report that they diet either “very often” or “sometimes.” According to a Mayo Clinic study, three out of every one hundred girls will develop an eating disorder as they mature. Though it’s less talked about, boys are not immune to the illness—one out of every 10 people with an eating disorder is male, and that number is growing as well, according to Dr. Roberto Olivardia of Harvard Medical School, a clinical psychologist who primarily treats men and boys with the disease. If you suspect your child might have an Eating Disorder, take them to your family physician or pediatrician right away. When you take your child to your family physician for a check-up, tell them why you are doing so. “As a parent, you always have the responsibility to be as honest as you possibly can, if you want your kids to be honest,” says Dr. Lockhart. “Expressing concern makes children feel safer than not telling them why they’re going to the appointment.” Giving the child some control over what’s happening is also a good idea. Allow them to see the doctor first on their own, but tell them you will speak to the physician as well. “This gives kids control in a safe way,” she says. 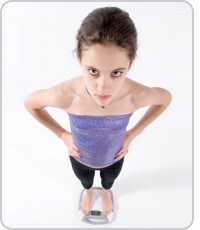 In the case of girls, weight loss can become a way to interact socially. If you notice your daughter is hanging around with other girls who are excessively thin and obsessed with dieting, your antennae should go up. “It’s time to sit down and talk,” says Blier. “They’ve probably already been sharing unhealthy diet tips with their friends.” In addition, there are any number of websites and blogs that tell people how to lose weight, “whole websites dedicated to giving advice to people on how to go to a social function and appear as if you are eating when you’re really not, how to cut calories and lose weight.” People with anorexia and bulimia will log on daily to report how much—or little—they’ve eaten, and how much weight they’ve lost. The social piece of it is that they encourage each other to keep going, often with dangerous results. If you suspect your child has an eating disorder, don’t try to force feed them. “Don’t try to put them into situations where they’ll eat—don’t try to take the treatment on yourself,” says Blier. “By trying to make the food they want, it will just result in them not eating it. Don’t schedule a family activity during their exercise time. Don’t you try to control what they’re doing. You’re not a treatment provider, you’re their parent.” Statistically speaking, the most important thing is to address the problem as soon as you sense there might be one, and that you get your child some good medical help as soon as possible. After consulting with your physician, if it’s determined that your child has an eating disorder, the next step is to find a counselor or accredited eating disorder program. Many use cognitive behavioral therapy to address poor eating habits and give patients a healthier approach to food. If the situation is more critical, children may have to enter an inpatient program. If it’s severe enough, they may be put on IV fluids and admitted for a longer period of time. Family counseling may also be recommended. For more information, visit http://www.empoweringparents.com/parenting-resources.php. Footnote on Michelle: Thanks to counseling— which at times included members of her family— and to the hard work Michelle did to change her eating habits, today she is a healthy mother of two who has been at a normal weight for more than ten years. Grace Guerrette, PSL Specialist, contributed to this article.